So, truth be told, I have started this post 3 different ways. First, I thought I’d talk about how great life is. I deleted that because we started doing taxes and my anxiety rose. Second, I wanted to share that this month is National Nutrition Month and just why you should eat your veggies. And now, for the third and final time, I’m going to chat with you about why I like you. 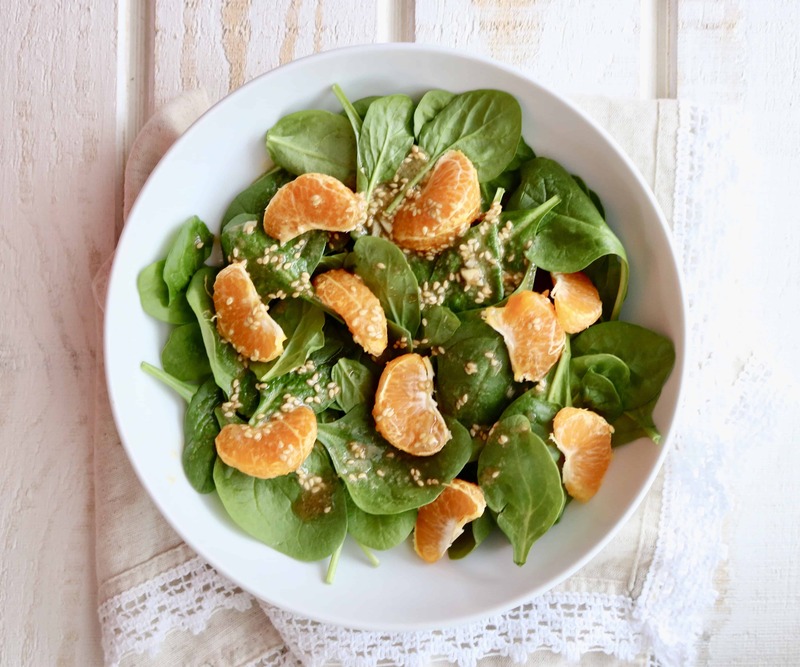 Does this have anything to do with why you should make this Sweet and Spicy Sesame Dressing with a Spinach Salad & Clementines? 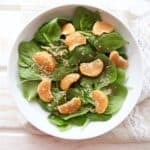 But, rest assured, you should totally make this dressing and salad because it’s delicious, nutritious and so simple. Now, I’ve been thinking a lot lately about this blog. Mainly, the question of why I continue to write and create recipes when there is inevitably a vast sea of “healthy living bloggers” these days. And then it hit me, I don’t write to hit 100,000K page views like I thought bloggers were supposed to aim for. I write because I like you, I like food, I like creating recipes, and I have fun while doing so. If you could only see how many smiles I have while interacting with you on social media, reading your comments or heck, even just knowing I’ve created a delicious recipe that may be served for someones dinner tonight, you’d get why I continue to blog. So, my friends, thanks for being so likable! Okay, and I like you so I thought MAYBE you’d be more likely to make this if I showed you how easy it is. So, I made a video… one of my first! Brace yourself, you’ll see a small little “peep show” around 22 seconds. No, not that kinda peep show, a Lizism peep show :)! CLICK THE LINK BELOW TO SEE IT! Thanks for joining me on Shaw’s Simple Swaps and rest assured, I’ll keep the recipes coming with a little bit of Lizisms every now and then too! 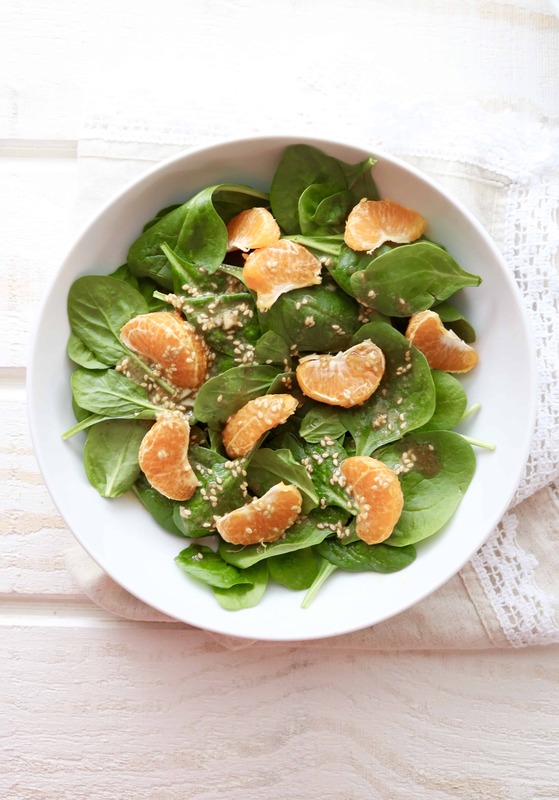 Sweet and Spicy Sesame Dressing with Spinach & Clementines - The perfect vegetarian and gluten free sauce to enjoy in a flash! In a bowl, mix garlic, honey, tahini, sesame oil, soy sauce, sesame seeds and water. Combine thoroughly. Toss spinach with dressing and portion into 2 to 4 bowls. Top with clementine segments. Dressing yields approximately 6 tablespoons. PS- Make this a full meal by adding sliced chicken, salmon, shrimp or tofu! 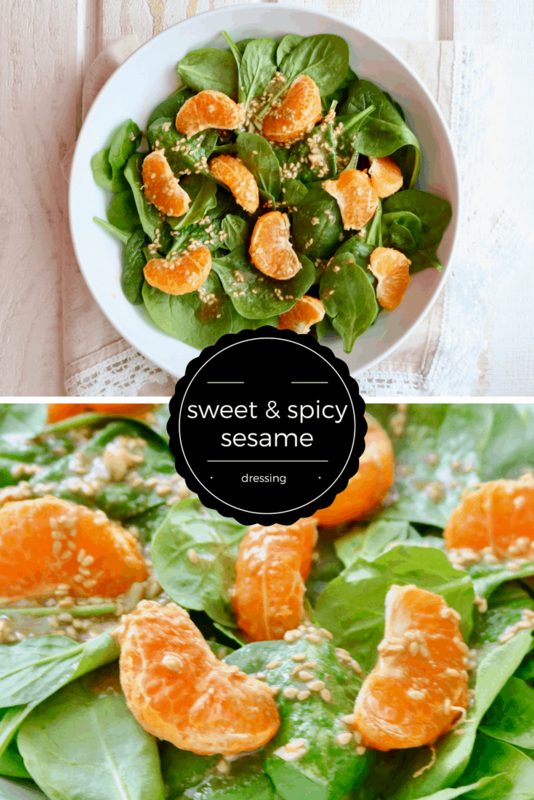 PPS- Tell me, what’s your favorite way to use this Sweet and Spicy Sesame Dressing? Salad? Pasta? The possibilities are endless! Yum! This sounds delish Liz! Ah thanks Sara- you are so kind!